Since 1954, Godzilla has been brought to life by a man in a kaiju suit, animation, computer graphics, motion capture, and now, 3D anime. And you know what, the monster’s latest incarnation ain’t half bad. Note: This review has some spoilers. Opening today in Japan, Godzilla: Planet of the Monsters depicts a world invaded by kaiju destroying everything in their wake. After decades of this, in 2048, an intergalactic vessel called the Atratrum begins a 20-year journey, with its human passengers looking for a new planet to settle. They discover their destination isn’t suitable for habitation, and a course is set for Earth, with a new plan to defeat Godzilla, the most powerful kaiju of all. Upon returning home, the space travelers learn that while only 20 years have passed during their journey, twenty thousand years have passed on Earth. The planet’s environment has changed, but one thing that hasn’t is that Godzilla is still a lethal menace. Now it’s up to them to defeat the monster(s) and reclaim their planet. The initial set-up is well done. Life inside the Atratrum spacecraft is vividly portrayed. It’s bleak to the point that basics like water are rationed. Every article of clothing and all the space suits are soiled, scuffed and scratched. It’s supposed to make the anime look gritty, something not typically shown in space anime, and to a point, it does. But once I noticed the scratches, I couldn’t stop looking at everyone’s outfit, checking if all the humans wore nicked-up space suits. They all did, making every character seem the same. What, no one was fastidious about that kind of thing? Surely there had to be someone worried about space suit scratches and soiled uniforms. That was emblematic of a larger problem: characterization. There’s the main protagonist Haruo Sakaki (below), who has a raison d’etre and wants to defeat Godzilla to restore the good of humanity, and then, there’s basically everyone else. Most of the supporting characters aren’t all that interesting (there are exceptions like the alien Metphies), but these samey souls exist only to push the plot onward. The character designs aren’t that great, either. Flat personalities and uninspired designs sure can make these three appear nearly indistinguishable. As expected, Gen Urobuchi’s script isn’t sunshine and roses. I mean, this is the guy who wrote Puella Magi Madoka Magica and Fate/Zero. (However, Planet of the Monsters isn’t nearly as depressing as those other two.) Urobuchi’s love of futuristic tech and technospeak are readily apparent. The dialogue does sound cool, and even as jargon is flying around, the plan that Sakaki hatches stays in focus, thankfully keeping the plot straightforward. That means Planet of the Monsters can move along at quite a brisk clip, sometimes at the expense of developing its characters. Planet of the Monsters is only 89 minutes, and that’s a little short even by animated film standards. Just a few more minutes of solid characterization could’ve also served as breathers as the plot hurtled toward the inevitable showdown. Perhaps thinking about this movie as a standalone 89 minute feature isn’t fair, but right now, that’s all I got. Once the film enters the home stretch, the pace becomes relentless. (It also could’ve done with a more varied monsters on the planet of the monsters!) The anime version of Godzilla is surprisingly effective and frightening, and while the score vacillates between lacklustre and bombastic, the animation throughout is excellent, and the climatic action set pieces, filled with cool military hardware, are well executed. During the sequences, the camera framing and direction are spot on. However, because supporting characters aren’t that full fleshed out, if they’re killed fighting Godzilla, for example, the emotional impact is muted. It’s like the filmmakers are hurrying to get to the Godzilla confrontation, but also to the next film in this trilogy. 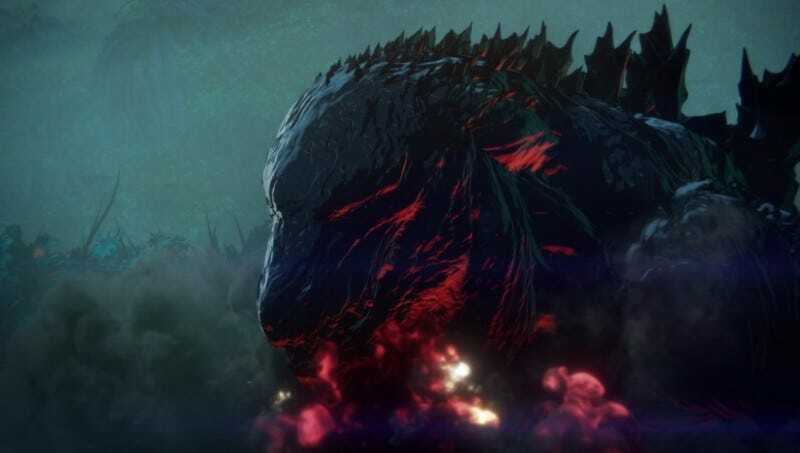 In Godzilla: Planet of the Monsters, it seems as though the third act is just getting started just as the picture is ending. There’s not enough closure to feel satisfying. Even with these complaints, the overall experience was good, leaving me hoping that it dovetails nicely with the next entry and addresses these shortcomings. It’s not a perfect picture, but it was a powerful proof of concept: Godzilla works as an anime. I didn’t even miss the man in the suit. Godzilla: Planet of the Monsters will be available worldwide on Netflix in 2018.